Services | David J. Wright, D.D.S. An implant is an artificial tooth root placed into your jaw to serve as a base for individual replacement teeth, bridges or a denture. Today’s dental implants are virtually indistinguishable from other teeth, and will allow you to once again speak and eat with comfort and confidence! If you are in good general and oral health, you may be a candidate for dental implant placement in our office. We offer an affordable alternative to conventional braces, especially if you are only interested in a limited “straightening” of your front four teeth. Dr Wright developed an invisible aligner technique to improve the alignment of your upper and lower front four teeth. Depending on the initial color of your teeth, and the degree of whitening you wish to achieve, we have several options. The most favorite is out take home whitening kit, with permanent results in less than 2 consecutive weeks of usage. We also offer our power in-office one hour whitening without the need for a hot, annoying light in your face. 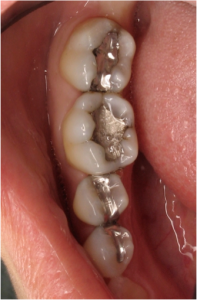 There are no proven health concerns associated with silver (amalgam) fillings; I just think they’re “ugly”. If you had ever wanted them replaced, but are not sure how they will turn out, just look at these pictures below. This is a typical result of the work we provide on a consistent basis. Which would you prefer to have showing when you smile??? A lifetime of health, comfort, and function of the teeth and their supporting gum tissues is the primary goal at our office. This goal can be reached through good home care and regular professional treatment. Did you know there is a direct correlation between heart disease and gum disease? With regular appointments, our hygienists will show you an effective home care program to help control this disease and help you keep your gorgeous smile for a lifetime. Veneers can be contact lens-thin and are placed over existing teeth. Sometimes, this can be accomplished without having to remove painful tooth structure. Veneers are the permanent cosmetic solution for stained, chipped, discolored or crooked teeth. To see if you qualify for veneers, make an appointment with Dr. Wright today. Are you suffering from chronic headaches? Do you wake up everyday in PAIN, eyes shut tight and your head buried in your hands? Stop your needless suffering today. The FDA has approved a dental device to PREVENT headaches, migraines and jaw pain. It is called the NTI-tss (nociceptive trigeminal inhibition tension suppression system… aren’t you glad you now know what it stands for…). If you clench, grind, suffer from medically diagnosed tension or migraine headaches, or have TMD (temporomandibular disorder, many people erroneously call this “TMJ”) the NTI appliance will make your life more comfortable. It is custom made in our office and can be made in a single appointment. What other effective option do you know about that can be used during pregnancy, or without many of the side effects of medications? The NTI prevents and reduces the painful and damaging effects of bruxism (clenching). Signs of bruxism include: headaches, loose teeth, worn or chipped teeth, ditched grooves along the gumlines of teeth, pain behind the eyes, facial pain, tooth sensitivity, crowded teeth, receding gums, ringing or feeling of fullness in the ears, to name a few. The NTI is not like the older technology of the large “mouthguard” that is made of a hard plastic and covered all your upper teeth. 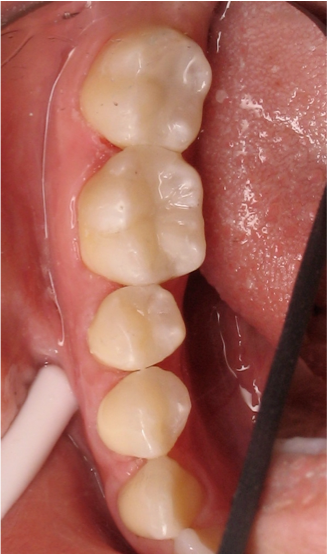 The NTI is smaller, more comfortable, and can be custom fit on your upper or lower front teeth. A detailed TMJ and muscular exam is performed to record a baseline of your specific condition. To accurately and quickly diagnose possible conditions with your jaw joint, a joint vibration analysis is performed, including a report of the results. We are the FIRST practice in the valley with a dentist certified to offer the Joint Vibration Analysis technology and determine the health of your jaw joint. It is simple, effective and quick. For those of you who cannot tolerate the CPAP, we offer a FDA approved comfortable alternative known as the Somnomed. It is an oral appliance treatment for sleep apnea and snoring, with incredible and comfortable results!!! We welcome you and look forward to providing you a lifetime of dental care. Website Designed and Developed by unWired Broadband Inc. - Copyright © 2013. All Rights Reserved.